Barbarians chance made England great Waterman want to keep on playing! The chance to pull on the famous Barbarians jersey was a key factor in England great Danielle Waterman’s decision to extend her playing career, the World Cup winner tells us in an exclusive interview. Full back Waterman announced her retirement from international rugby this summer at the age of 33 after winning 74 caps. England’s youngest ever female player on her debut in 2003, she went on to appear in four World Cups, lifting the title after scoring in the 2014 final against Canada, as well as representing Great Britain at sevens in the 2016 Olympics. Waterman was part of the Sky Sports commentary team when the Barbarians dazzled on their way to a record-breaking 63-15 win over England in the Quilter Cup and had witnessed the impact the launch of the club’s women’s team made on the Wasps teammates involved in inaugural matches against Munster and the British Army. After the men had run riot at Twickenham, Waterman asked her Twitter followers if they thought the Baa-baas women’s team should be included in an international double-header. She was bowled over by the positive response and more than 700 retweets while acknowledging some of the logisitical difficulties. "I’m glad I put it out there," Waterman said. "There’s such a buzz around the men’s team, a real appetite for the women’s team and it’s good to see that opinion voiced." Taking on international women’s sides appears to be a natural next step for the club. “Genuinely, one of the reasons I’m continuing playing is that the opportunity might be there to play for the Barbarians,” Waterman said. "I just think it shows everything positive about the game in a non-restrictive manner. "I saw all the Wasps girls involved in the first game and the degree of passion they had for it before they went and when they came back. It brings the rugby community together and that’s unique. I heard the girls coming back saying ‘she was so much fun’ and ‘she was brilliant to play with’. All of those things you usually don’t get to do. "The next step is definitely to play against international teams. I think that where the game is at, the international calendar would welcome it. Lots of quality high-level women’s games are needed and the Barbarians would add to that. In the Southern Hemisphere there’s New Zealand's Kelly Brazier (“It'd be brilliant playing outside one of the best inside backs in the world.") and Shannon Parry from Australia (“Someone I've played against mainly in sevens but a brilliant back-rower”). Certainly the Barbarians commitment to audacity and invention fits perfectly with Waterman, whose pace and footwork made her such an exciting attacking asset for club and country. 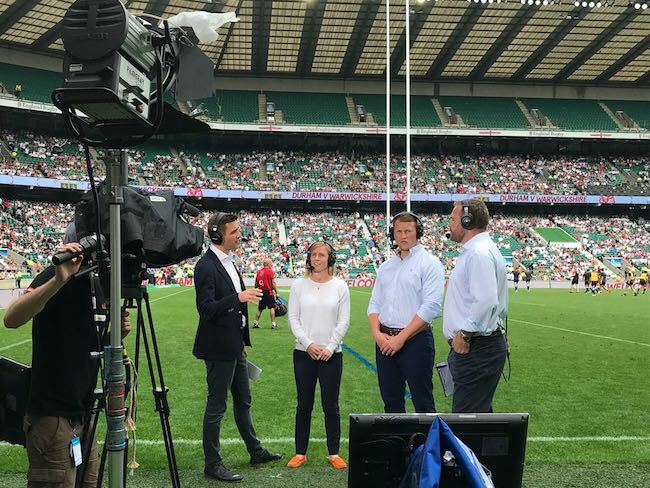 "You get better when you’re having fun"
She enjoyed witnessing Pat Lam’s men’s team light up Twickenham alongside Johnnie Hammond and Andy Goode in the Sky Sports commentary box – but it was as much for the Barbarians’ attitude as their nine-try fireworks. “I loved the way they challenged England,” she said. "People talk about the flair and there were some unbelievable offloads because they could play with the freedom you don’t necessarily get with professional contracts. But actually they did the basics really well and that’s a credit to the organisation Pat had done. "Benjamin Kayser was interviewed on the bench and said ‘It really reminded me how much I love rugby. It’s everything about the game I love.’ I just think that summed it up from a player who’d literally just come off the field and still recognised that.